Leading a healthy and balanced lifestyle seems out of reach or impossible for most working professionals. We believe the impossible is possible through the integration of wellness principles into the workplace. 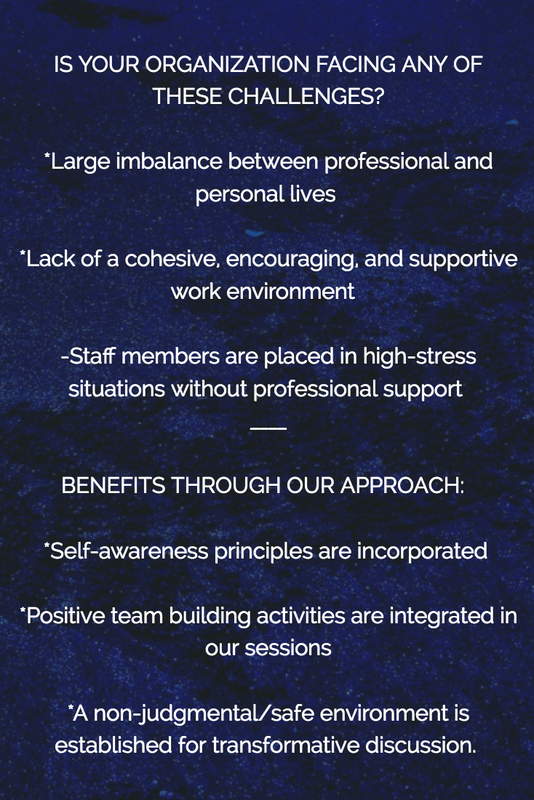 Papilia’s sessions are delivered in an interactive and non-judgmental manner aimed to increase employee wellbeing, productivity, and retention of staff. Self-care and self-awareness are fundamental building blocks to relieving the stress and pressure we place upon ourselves every day. Papilia offers workshops on daily actions that individuals can practice to become more self-aware as a means to relieve stress and live a more mindful professional and personal life. Optional yoga sessions are also available with our session(s). Understanding your team communication and leadership dynamics is key to developing trust and building meaningful relationships for long term professional and personal success. Papilia will provide your team with customized and practical tools to incorporate into your daily life such as how to listen to your audience, how to communicate effectively, how to lead with confidence, and how to develop healthy relationships that foster sustainable development outcomes. Our session(s) help people discuss complex issues in a fun, non-judgmental, and productive manner. Upon completion of our session(s), you will have a rich understanding of your own cultural communication style in conjunction with other cultures you interact with in your professional and personal life. Other activities chosen in conjunction with the culture mapping exercise will enhance your ability to be more productive and lead a healthier lifestyle.